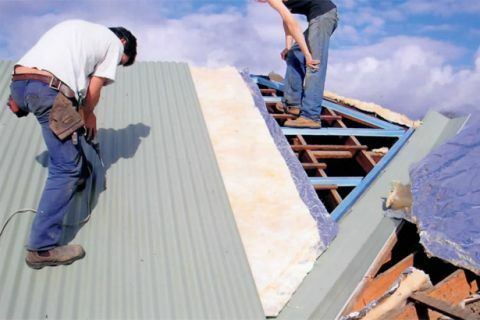 Need Roof Repairs in the Yarra Ranges? Call on the team at Roof Specialist! We have decades of combined experience in repairs, replacements and roof restoration in the Yarra Ranges and surrounding areas. You get a great choice of materials, including Colorbond steel in a wide range of different colours which can be matched to the existing exterior colour scheme of your home. All our staff work in accordance with WorkSafe rules, and leave your property clean and tidy after the project is complete. The best part? All of our work comes with a generous ten year warranty, so you can be sure you're making a great investment in the future of your property. For more information or to get your free no-obligation quote, call us now on (03) 9038 8110 or 0410 437 057. Fall protection for roof work - where there is a risk of a fall from a height of two metres or more, implement external fall protection in the form of physical edge protection. Eg: guardrailing or perimeter scaffolding Breaches of these regulations are very severe. We follow all regulations. Doncaster, Ringwood, Box Hill, Camberwell, Mont Albert, Nunawading, Burwood, Vermont, Hawthorn, Mitcham, Bayswater, Balwyn, Surrey Hills, Donvale, Ferntree Gully, Forest hill, Glen Waverley, Heathmont, Mulgrave, Rowville, Kew, Blackburn, Boronia, Wantirna, Croydon, Mt Waverley, the Yarra Ranges and Melbourne's other eastern suburbs. We offer obligation free advice & quotes. To start working with Roof Quotes on your new tile roof, roof restoration & maintenance or roof replacement solution, call us today.